Back in July we posted about the film Food Inc., wherein we criticized Chipotle for not signing on to an agreement to pay tomato pickers in Florida an additional 1 penny per pound. Companies like Whole Foods and Bon Appetit had signed on to the agreement, and Chipotle's refusal seemed to go against their mantra of bringing more sustainable foods and "food with integrity" to their customers. 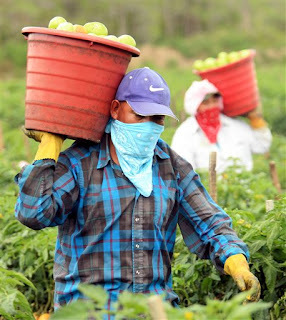 "Similar agreements between other large tomato buyers, like Chipotle, and the CIW have been blocked by a Florida tomato industry cooperative. Under most of those agreements, money earmarked for farm workers is accumulating in escrow accounts rather than reaching the farm workers for whom it is intended. By working directly with East Coast Farms, Chipotle will be able to pass the additional wages directly to the workers." "This agreement will make a difference in the lives of workers who pick tomatoes for Chipotle, but our commitment goes well beyond this. We are constantly looking at all of the ingredients we use, and how we can use our purchasing power to improve conditions for farm workers, raise animal welfare standards, and minimize environmental impacts. These choices come at a price, giving Chipotle the highest food costs in the industry. But we continue to think it is the right way to run our business. It's how we are changing the way people think about and eat fast food." Labels: corporate issues, food, U.S. This is excellent news. I wasn't sure if they would fold or not. This is a surprise, but a welcome one! The question remains though of whether to eat Chipotle or not? It remains a chain restaurant (with partial ownership by McDonald's), and could be seen as perpetuating the need for undocumented labor to satisfy the U.S. demand for cheap food. I guess this does improve the situation, but by how much really??? Well put, anonymous user! Between McDonald's ownership and the tomato issue, and whatever else we aren't seeing...I too question whether or not to end my boycott of their establishment. Thanks to Recycled Minds for the update. Chipotle is NOT owned by McDonalds. McDonalds bought a majority stake in Chipotle when it was only 14 stores. McDonalds has since sold it back to the public. Chipotle is now a PUBLIC company. Although McDonalds owns shares of that company, they have the right to, just as you and I have the right to buy and sell shares of Chipotle stock. Further, Chipotle management always kept McDonalds at arms length, and have prevented them from interfering in Chipotle food standards.